Ron & Hermione Screencaps [Prisoner of Azkaban]. . HD Wallpaper and background images in the romione club tagged: harry potter and the prisoner of azkaban screencaps ron weasley rupert grint hermione granger emma watson romione movie 3 2004. 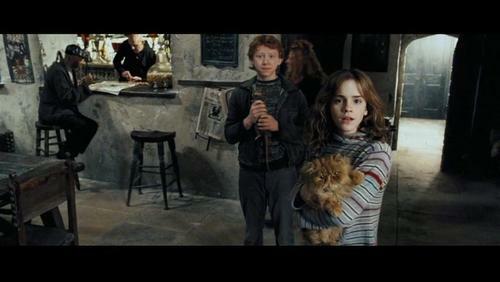 This romione Screencap might contain brasserie, quarto de família, quarto familiar, sala de estar, sala, sala de frente, salão, and sala da frente.